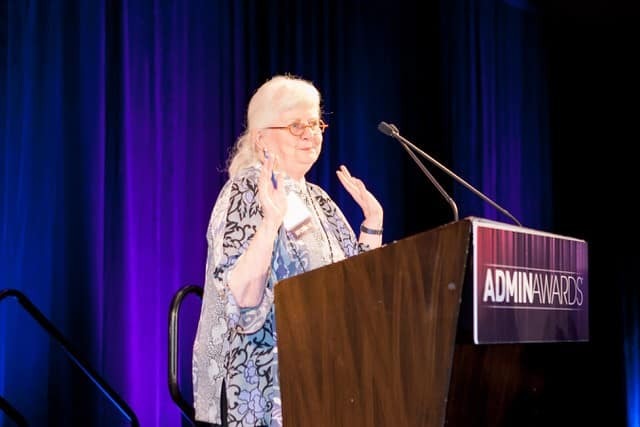 Silicon Valley | Admin Awards - The first and only awards program in the U.S. that publicly recognizes the invaluable contributions of Administrative Professionals. Shiela WattChief Executive AssistantQuanergy Systems, Inc.
Two Business airfares on Emirates Airlines to an exotic location and luxury Accommodations at Taj Hotels! Thank you to Morrison Corporate Travel for making this exceptional experience possible! ADMINUNIVERSE - $500 DSW Gift Card: No one understands what it’s like to walk in an Admins’ shoes more than Joanne Linden! With over 30 years of Admin experience and now Master Trainer and President at AdminUniverse, Joanne wants you to walk in style all year with a $500 shopping spree at DSW! Anne is currently an Executive Assistant at Sage Intacct supporting the Managing Director, Executive Vice President and Vice Presidents of Engineering, Product, Marketing and Operations. Anne has more than 15+ years as a dedicated Administrative Professional in large, mid-size and start-up environments. Over the years she has gained a reputation for “getting it done” – either a significant project or day in day out resourcefulness and achievement of a variety of tasks. Anne keeps attuned to everyone she works with to ensure their day goes smooth and more enjoyable as they work towards completing their goals and priorities. Anne loves mentoring others. In March Anne completed her first Spartan Obstacle Course Race. Kristy is the Executive Assistant to the Chief Medical Officer at Satellite Healthcare. As an accomplished professional with 20 years’ experience in the administrative field, she brings a wealth of knowledge, leadership and spirit to the team. In 2018, Satellite awarded Kristy the Medical Clinical Lead Kindly Light Award in recognition of exceptional efforts in advancing superior and compassionate patient care by bringing hope and changing lives. She also received the Navigator Award for her outstanding interpersonal skills, resourcefulness, creativity and diplomatic approach. Recognized as a natural leader, she championed teams toward operational excellence via best practices, mentorship and building commitments through cross-departmental collaborations. Kristy holds a bachelor's degree in Recreation & Leisure Studies with a minor in Business Management from SJSU. She later earned an Administrative & Executive Assistants Certificate from UCSC Extension. She enjoys spending time with family and friends, snowboarding and playing volleyball. Stephanie Magana is a 1st year Executive Assistant at Intuit who began her administrative career supporting the SVP of US Sales and the VP of Partner Sales. Stephanie joined Intuit as a recent graduate of San Jose State University where she turned her contracted position into a full-time role after 8 months. Her can-do mindset and ability to multi-task in a fast-paced environment have allowed her to become a successful and trusted business partner among sales leaders. In addition to managing the day to day needs of her executives, she has also successfully organized a number of events for her own team as well as broader Intuit groups. When she’s not working, she enjoys staying active with exercise classes and spending time with family and friends. Office Manager of the Year AwardAnthony Castaneda, BloomReach Inc.
Colleen Barrett Award for Administrative ExcellenceDenise Polanco, HP Inc.
Loyalty AwardYasmin Patel, Synopsys, Inc.
Kristy Wolk has been with Maxim Integrated as an Executive Assistant since 2008. She holds a Bachelor of Science in Public Relations with a Minor in Communication in the Information Age & an A.A. in Liberal Arts. She believes in continuous employee development and is always looking for new projects to join. She is a member of Maxim’s CFO Mentor Committee, Assistant Forum Team and the Global Assistant Portal Team. Outside of Maxim, Kristy is on the board of her children’s school and volunteers when she can find time. Kristy believes in open communication and strives for a strategic partnership with her manager. With three children and a very busy schedule, she understands the art of creating a work/life balance. Kristy admires photography, enjoys a good road trip, and welcomes the idea of exploring new ways of doing things. She strives to stay creative, positive and most importantly, healthy. Anthony has been the Facilities Manager at BloomReach Inc. for just over a year now. He moved to California 6 years ago and has since acquired a passion for Facilities Management. Anthony spins many plates to ensure the facility runs efficiently, with safety and security as the top priority. He has made a large impact in a short period of time at BloomReach and is always looking for ways to improve the workplace experience. From delivering mail and ordering supplies to personally conducting office re-configurations and managing construction projects at multiple locations, he seems to always have it under control. He is a lover of music and spirits and enjoys nothing more than sharing these experiences with great friends. On the weekends, you will find Anthony hiking, biking and traveling as well as playing an occasional sand volleyball game. Elena represents all that is good in an administrative professional. As Senior Legal Assistant at McManis Faulkner, her attitude is always 'I am part of a team'—and she really is. There is no one more motivated by the desire to continually grow and improve her skills and share her knowledge with her colleagues. Elena’s excellent communication skills and rapport with other team members, clients, fellow employees, and management make her a true asset to the firm. Elena leads by example. The minutiae involved in preparing a case for trial is mind-boggling but she takes pride in finding ways to organize and make the mountains of information manageable. She trains all the new legal assistants, teaching them the systems she put in place and keeping the firm functioning like a well-oiled machine. Always first to step up and contribute in any way that she can, Elena’s loyalty and commitment to the firm is exemplary. Elena is a California Certified Legal Secretary and a long-time member of the Santa Clara County Legal Professionals Association (SCCoLPA). Currently, she serves on SCCoLPA’s Executive Board as Governor. She shares the association’s passion and commitment to the education and training of legal professionals. Carolyn is an Executive Assistant at Juniper Networks, Inc. where she has worked for the past 13 years. In this role, she has supported multiple VPs and their departments in IT Infrastructure and IT Applications Management. Prior to Juniper, Carolyn was an Executive Assistant at Cisco Systems for six and a half years supporting the VPs and departments of IT Finance and IT Web Platforms. Fortunately in these roles, she has been able to fulfill her passion for service by organizing quarterly volunteer events, mobilizing the support of her coworkers and consequently sharing this passion for others to do the same. She holds an Associate’s Degree in Business from Mission College in Santa Clara and West Valley College in Saratoga. Carolyn is an avid 49ers fan. She enjoys volunteering in her community and her daughter’s school, playing with Kona her Golden Retriever, being around the horses on her ranch, and hosting international exchange students from Germany, Brazil and the Netherlands. Denise Polanco is a renowned C-Level Executive Assistant for HP Inc., a Fortune 100 company with more than $52 billion in revenue. She currently serves as executive assistant to HP’s President and CEO, Dion Weisler. During her 16+ year tenure with HP, Denise has supported a variety of C-suite executives and is experienced in managing everything from complex events and customer experiences to Board of Director's engagements and high-profile government and business endeavors. In addition to managing all the CEO activities, she orchestrates a diverse community of C-suite executive assistants and passionately spearheads internal training and recognition programs for the EA community. Denise is a fierce advocate for building careers across the company and is actively involved in the Santa Clara community. Before joining HP, Denise supported executives at Omidyar Network and Silicon Graphics. Denise currently resides in San Jose and holds a Political Science Degree from Santa Clara University. Jaime Miller has found her true passion as an Executive Assistant, which she defines as helping people and organizations become successful. She joined LinkedIn in 2016 as Executive Assistant to the Vice President of Global Engineering Operations, where she has developed a strong brand as someone who can be consistently counted on. In addition to her day-to-day responsibilities, she has led various projects, including supporting the IT teams in the largest company-wide migration from Google Mail and Calendar to Office 365. With over 14 years of administrative and event management experience, Jaime’s influence extends beyond her executive and team. She enjoys mentoring others and sharing best practices within the administrative community. To further support those in and out of LinkedIn, she serves on the Administrative Professionals Conference Advisory Council. Outside of the office, you will find Jaime at the ballpark supporting her three children, or wine tasting with her family and friends. Adriana is the Executive Assistant to Paul E. Lorenz, Chief Executive Officer at Santa Clara Valley Medical Center. Santa Clara Valley Medical Center is a comprehensive health care delivery system with a Trauma Center for adults and children, a Regional Burn Center, and a nationally recognized Rehabilitation Center. Adriana started her career as an administrative professional with Santa Clara County in 1990. Over the past 26 years, she has steadily climbed the County’s administrative professional ladder and in 2007 advanced to the position of Executive Assistant to the Chief Executive Officer; the highest-ranking office professional at Valley Medical Center. Adriana is proud of her career in public service and values her ability to bring hope, joy and a smile to everyone she comes in contact with each day. Adriana enjoys scrapbooking, reading, and hiking with her husband, Arturo. She also enjoys cooking and watching movies with her daughters, Jessica and Juliette.